At this time of year, for the last century, we have remembered the great loss of life caused by the First World War. The bannerette shown here is part of an exhibition created by the textile artist Clare Hunter, now on in the Stirling Smith until 20 November. 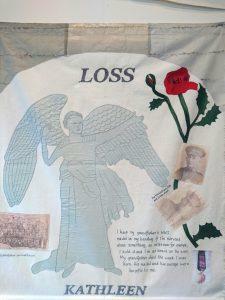 The exhibition Material Matters was created through collecting stories about cloth and sewing from people all over Scotland, and working with them to create memorial banners demonstrating the significance of cloth and threads in our lives. In this instance the story is about Kathleen Gray of Dundee, who was born in the same week as her grandfather died. She was given his medal and grew up hearing stories of his bravery. She has always kept his medal and ribbon in her handbag, and she touches it when she needs a bit of courage herself. The War has shaped and coloured her life, symbolised by the medal. Cloth of significance but of little monetary value is often kept in families, and Clare Hunter is collecting stories of lap bags, cushions and other treasured pieces of cloth. These will be archived in the Glasgow Women’s Library, and if you would like the material which matters to you remembered, visit the exhibition at the Smith and leave your story in the box.